Hyperloop One has announced the winners of its global challenge to identify the strongest new Hyperloop routes – and Canada is home to one of them. The proposed Toronto – Montreal Hyperloop route is one of 10 winners, which also include routes in the United States, Mexico, United Kingdom, and India. By having their route declared one of the winners by Hyperloop One, currently the only company in the world to have successfully built a full-scale Hyperloop system, the team behind the Canadian proposal will now work with Hyperloop One to determine its commercial viability. Hyperloop One will now be committing business and engineering resources towards the Canadian route that could lead towards actually building said route in the future, which would dramatically change how Canadians travel between Quebec and Southern Ontario. The proposed Canadian route would cover 640 kilometers for a total duration of just 39 minutes. It would be split in two parts: 450 km over 27 minutes between Toronto and Ottawa, and 190 km over 12 minutes between Ottawa and Montreal. “The Global Challenge became a movement of thousands of people from more than 100 countries over six continents. Like us, they believe that Hyperloop will not only solve transportation and urban development challenges within communities, it will unlock vast economic potential and transform how our cities operate and how we live. Our successful test this summer made Hyperloop a reality, and now we’re ready to bring our Hyperloop system to the world,” said Shervin Pishevar, co-founder and executive chairman of Hyperloop One in a statement. According to the company, the 10 winning routes were chosen based on criteria including well-defined routes and implementation strategies, key stakeholder involvement from both public and private sectors, compelling business cases, as well as innovative and creative application ideas for implementing a hyperloop. 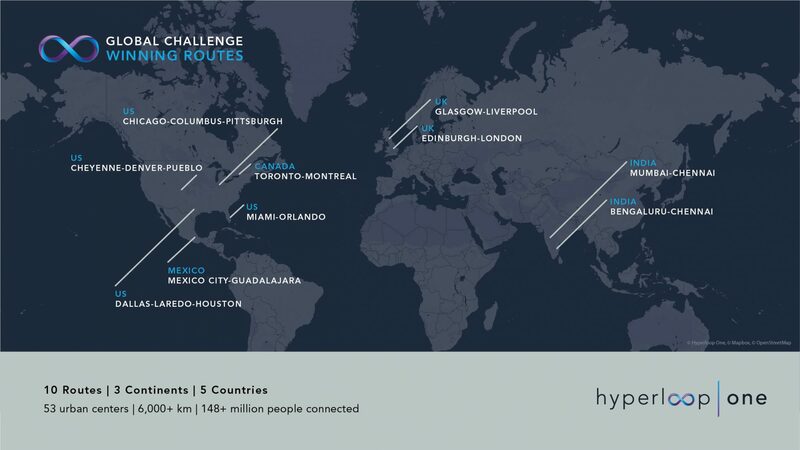 Overall, the winning routes of the Hyperloop One Global Challenge connect 53 urban centers with roughly 150 million people between the five countries. The combined distance of these routes amounts to 6,628 km. If you aren’t familiar hyperloop technology, here are the basics: Passengers and cargo are loaded into a pod that accelerates via electronic propulsion through a low-press tube. Once it picks up enough speed, the pod lifts above the track with magnetic levitation, allowing it to glide at airline speeds thanks to its ultra-low aerodynamic drag. Toronto – Montreal isn’t the only route trying to get off the ground in Canada. Earlier this week the city of Calgary carried a motion to support the development of a Hyperloop research centre and test track that would be operated by Toronto’s own TransPod, which aims to build a one-kilometre test track in 2019.